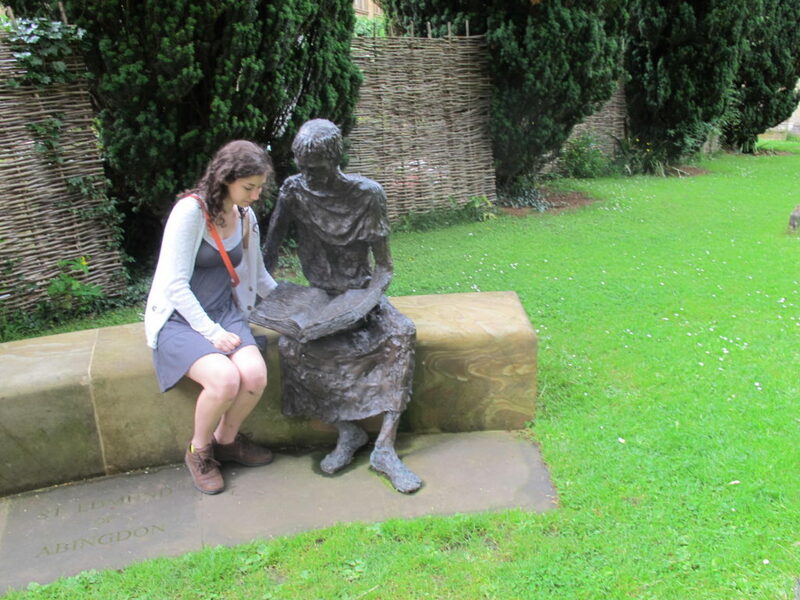 Jenny Keroack with seated statue of St Edmund of Abingdon in the churchyard. Photo by Geri Bain. 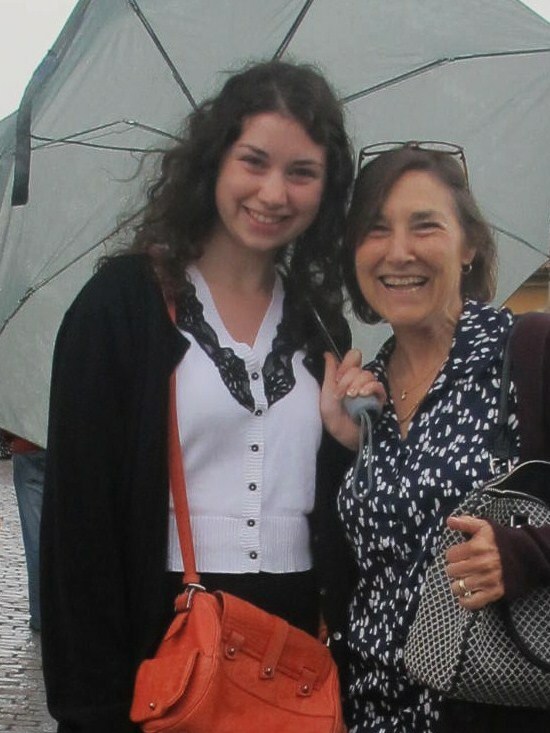 Inspired by the grand tours of aristocrats past and the more recent adventures of TV’s Gilmore Girls, 18 year old Jenny Keroack proposed that she and her mom, travel writer Geri Bain take their own grand voyage. This summer the two set out to share as much of the Old World as thirty days would allow. Starting in London and finishing in Barcelona, they recorded their favorite places and activities. Jenny’s are in italics while Geri’s are in regular type. Read about their adventures, explorations and all the schleps in between. The following is their second installment, logged from Oxford, England. I’m a big city lover so I wasn’t excited about leaving London to spend a night in Oxford; however, after having been there I’m a convert. The town’s long history as an intellectual center and the Harry Potter connection are definitely worth the trip. The Ashmolean. Photo by Jenny Keroack. College town culture: Like all great college towns, Oxford puts high culture at your doorstep. And Oxford’s relatively small size makes it easy to take in. During our two day/one night stay, we could have attended one of three Shakespeare plays (sadly rain precluded our attending the one we had selected) and visited more than 10 museums—most with free admission. 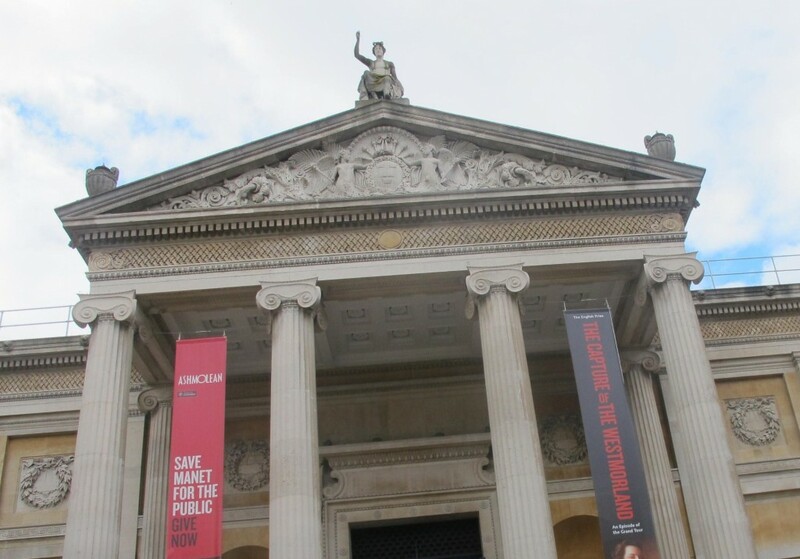 My favorite was the Ashmolean, Britain’s first public museum, with its Victorian exterior and modern light-filled glass interior with far-ranging permanent art and archaeology collections as well as fascinating changing exhibits. Keble College. Photo by Jenny Keroack. 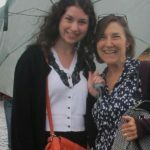 Student life: What better place to stay in Oxford than at one of the colleges! 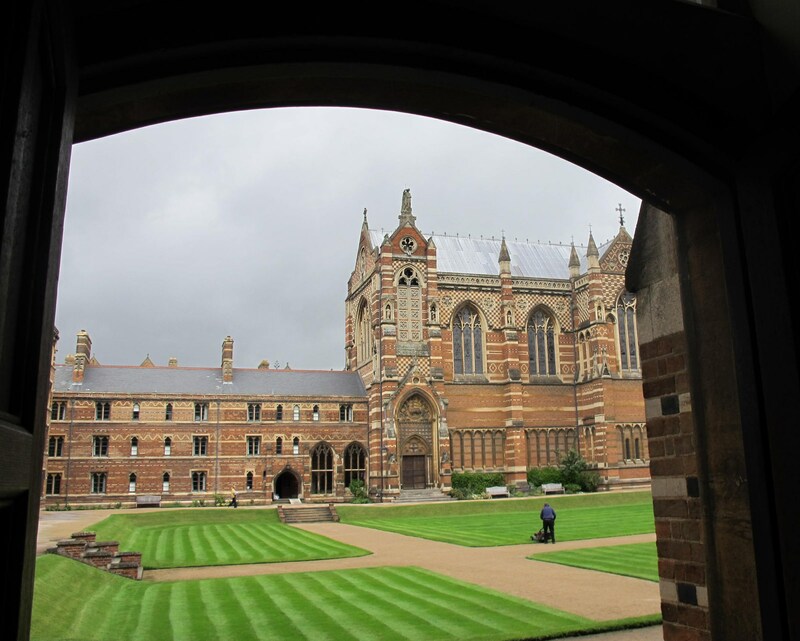 We chose Keble College (rooms can be booked during school breaks at http://www.keble.ox.ac.uk) because it offered the comfort of a private bathroom in an authentic 19th century college setting. We found the single “dorm” rooms (ask to face the historic quad) much larger and more atmospheric than most U.S. college dorms. We especially enjoyed our breakfast in the Hogwarts-like Dining Hall, the largest in Oxford. While not the hall used in the Harry Potter movie, it could have been with its long rows of seating and a head table where we could imagine Dumbledore and the teachers watching over all 300 of us. The Divinity School at Oxford. Photo by Jenny Keroack. Harry Potter: I’m a Harry Potter originalist; for me, the books are the truth and the movies are a mere interpretation. That said, I did see the movies, and obviously the beautiful places featured in the films became part of how I imagined the events in the books. One of the most unique things about Oxford is how much of the campus and town is featured in the HP movies. 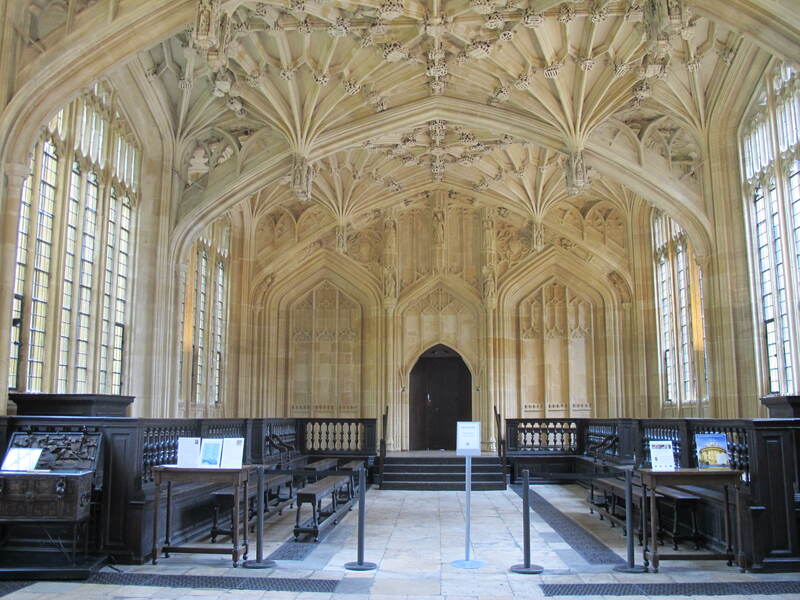 Many iconic places used in the films, such as the hospital wing, library, dining and steps where Professor McGonagall welcomed the first years, are in Oxford. Harry Potter-related sites are far from the only thing to see at Oxford but for fans they can be truly magical. Shopping in Oxford. Photo by Jenny Keroack. 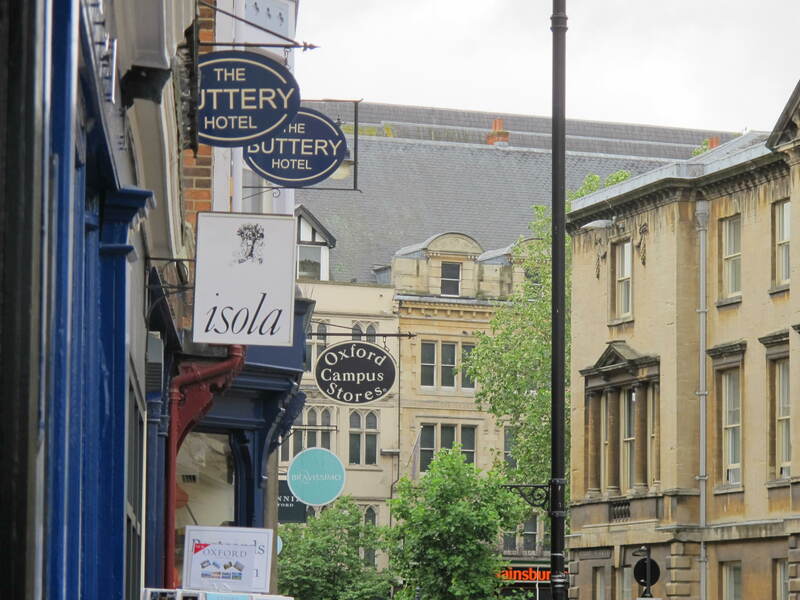 College Shopping: Oxford may not strike you as a big shopping town. That’s because it isn’t. However, there are some quaint little stores that you won’t find anywhere else. I got a rugby shirt at Castell & Sons on Broad St. with the Oxford insignia on it, which has the dual benefits of making me look both sporty and smart. Nearby, a sweet shop sold everything with delicate floral prints, from handbags to clothes to bedding. We also saw cute Oxford merchandise such as a cup that said “stay calm and study.” My mom also insisted on visiting the Covered Market, a traditional town market which dates to 1774; it sells mostly food, but there is some nice handcrafted jewelry. Whenever you get tired of the museums and all the heavy history of the school and town, Oxford shopping offers a fun and diverting alternative. A Walking Tour: Robert Walters, author of “Naughty Boys: Ten Rogues of Oxford” and various other books, was our guide for an anecdote-filled two hour group tour of the first English language university in the world and its town. 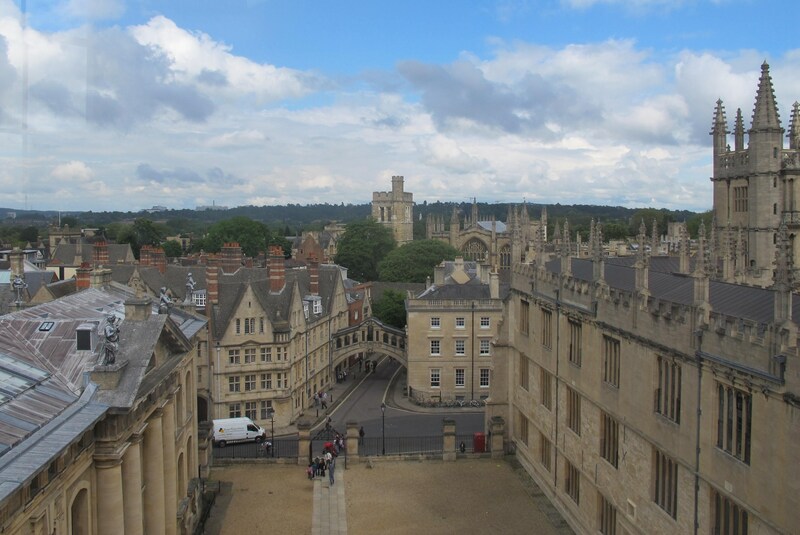 Booked through the Oxford Visitor Information Center, the tour made each building a springboard for stories about Oxford’s history, traditions and famed “Oxonians.” The town’s educational roots date back to 1096 with individual professors mentoring small groups of students. This high level of personal connection to individual professors continues to this day. Pointing out that each college looks like a fortified castle, Walters explained that in the “Town and Gown” wars of the 14th century, students ventured out at night at their peril, and the medieval residence halls built to protect students evolved into Oxford’s 37 colleges. Great Pubs: There is some excellent pub food in Oxford. Go to places where you see teachers or students congregating for the best meals. We had a great lunch (free range beef hamburger for me and beef pie for mom) at the King’s Arms. The pub, popular with students, is joked to have the highest IQ per square foot in the world. Another, the Eagle and Child, is famous as the meeting place for the “Inklings,” a group that included C.S. Lewis and J.R.R. Tolkien. At the White Horse, my mom and I sat next to a couple of professors for dinner and apart from the awesome homemade chicken and mushroom pie (and fish and chips for mom), it was amazing to hear these two worldly intellectuals discussing a woman one of them wanted to ask out and complaining about a party neither wanted to attend. Next: we take the Eurostar through the Chunnel to Brussels. Geri Bain, a widely published travel writer and editor, has written about more than 60 countries and contributed to publications including inc.com, N.Y. Daily News and Robb Report. While travel editor at Modern Bride magazine, she wrote an acclaimed guide to Honeymoons and Weddings Away. She is a past president of the New York Travel Writers Association and former editorial director of Endless Vacation magazine. 18-year-old Jenny Keroack wrote for the Observer Tribune from 2009 to 2012 and has been published in the Riverdale Press and Elegant Lifestyles. She was a researcher/blogger for the N.Y. League of Conservation Voters last summer and will be studying political science at the University of Chicago this fall. Looking forward to the Brussels report. Do they go to Bruges? Yes, Bruges is coming up in a couple of weeks! Looks like a wonderful adventure. Loved the quote, “The pub, popular with students, is joked to have the highest IQ per square foot in the world”!